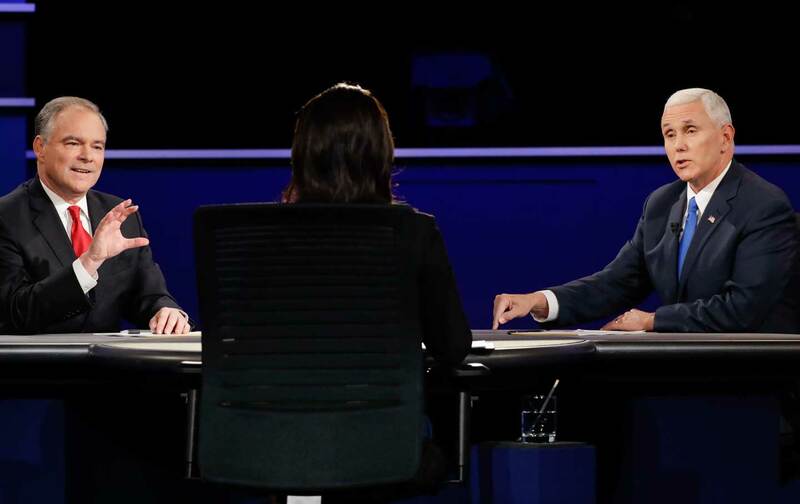 Kaine interrupted his way to the truth at the vice-presidential debate. GOP vice-presidential nominee Mike Pence checked in on aisle 4 at Longwood University Tuesday night to clean up Donald Trump’s epic mess of a candidacy. But Democrat Tim Kaine, Pence’s opponent, made Pence grapple with his own mess too. Advance media coverage treated Pence like the respected professional who was going to have to answer for Trump’s many mistakes, ignoring the fact that, to crucial female voters anyway, Pence has a lot of mistakes of his own to explain. Given that Kaine’s selection by Clinton last July disappointed many feminists, it was a remarkable way to end what was otherwise a herky-jerky, uneven debate. Pence did well enough for the cable pundits, who judged him the more “serene.” The far-right fetus-funeral supporter and cigarette truther (the tobacco industry minion once wrote in an op-ed “cigarettes don’t kill”), the smoother-talking Todd Akin, Pence had been presented as the “moderate” on the ticket, the one who might reassure Americans afraid of Trump that there’s a grown-up in charge. American women, however, are as threatened by Pence as by Trump. As I’ve written before: Trump likes controlling women sexually; Pence does it politically. When it comes to women’s rights, they are two patriarchs in a pod. And Pence showed it. He also showed that he can lie as well as Trump. Time and time again Kaine or Quijano presented Pence with stands that Trump had taken, only to see the loyal VP nominee deny Trump had ever said any such thing. Pence also lied about his own record, insisting the only reason he tried to zero-out Planned Parenthood’s federal funding was because that was a “fiscally responsible” way to address the deficit. No one believes Pence on that, including his own far-right supporters. The anodyne, white-haired Pence, who looks like he’d been sent by central casting to play the disarming, grandfatherly right-wing zealot that he is, did his best to make Trump seem like a reasonable presidential candidate Tuesday night. Meanwhile Kaine, “America’s nice dad” (in the words of comedian/author Sara Benincasa), was strangely judged the rude guy by cable pundits. Yes, he did interrupt some, partly when the placid Quijano failed to challenge Pence on any of his dissembling. “Six times tonight I have said to Governor Pence I can’t imagine how you can defend your running mate’s position. And he has not,” Kaine said toward the end of the debate. But Quijano almost never followed up. About Aleppo and Syria, I truly do believe that what America ought to do is immediately establish Safe Zones so that families with children can move out of those areas, work with our Arab partners real-time, right now to make that happen. The provocations by Russia need to be met by American strength. If Russia continues to be involved in this barbaric attack on civilians in Aleppo, the US needs to be prepared to strike military targets of the Assad regime, to prevent them from this humanitarian crisis taking place in Aleppo. Kaine also hit Pence repeatedly with Trump’s false assertion that most undocumented Mexican immigrants are rapists and criminals. The last time it came up, the GOP nominee sounded flummoxed. “You whipped out that Mexican thing again!” he told Kaine. I thought that would seal the debate for Kaine, since it sounded so hilarious, but alas, the cable talkers disagreed. I believe the polls will show voters saw it closer to the way I did. The GOP VP nominee was defeated by a guy who has more genuine respect for his running mate than Pence does for his. That’s what matters, and that will make all the difference.